22 artists will create 17 murals in the hopes of generating awareness and discussion of environmental issues facing the world's fresh water systems. Giant squid have been spotted on Montreal's St-Laurent Blvd. 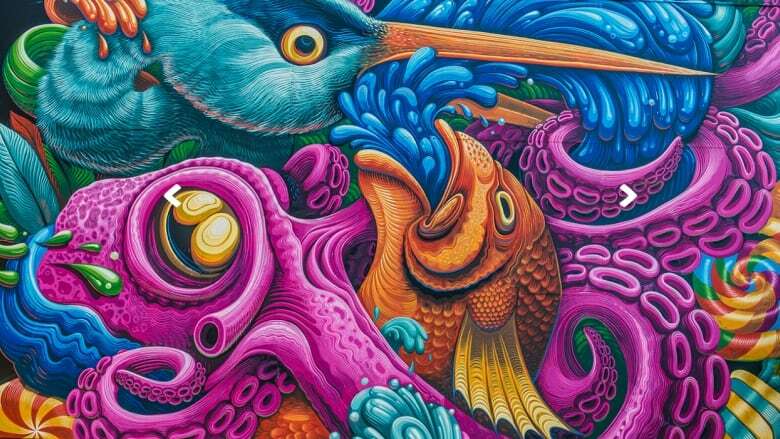 Great blue herons, too — because for the last two weeks, artist Jason Botkin has been introducing marine life to the otherwise land-locked strip. They're among the subjects in a series of 10 new works he's creating as part of the city's fourth annual Mural Festival (June 9-19). CBC Arts first met Botkin a few months back, when he shared several of his colourful plywood sculptures in an episode of The Re-Education of Eddy Rogo. Our web series The Collective also featured his graffiti project En Masse, whose collaborative murals have painted Montreal (and Chicago and Miami and most recently, Toronto) black and white. Follow him on Instagram and you 'll find regular examples of this multi-disciplinary creator's surrealist street art — psychedelic people and animals that look as though you're viewing them through X-ray specs, as intriguingly and grotesquely detailed as a medieval woodcut — or Basil Wolverton cartoon. And just like the series he's currently painting on St. Laurent, more and more of the creatures he's leaving on walls worldwide seem to spring from the sea. An octopus wrestles a fish and a heron (on a pile of candy) in this Halifax mural from 2015. This might be the only polar bear in all of Miami. Eel and octopus swim inside — and outside — the National Aquarium of New Zealand. Talking about the aquatic sidewalk project in Montreal, Botkin tells CBC Arts: "It does bleed into work I've been doing in general that has more environmental themes attached to it." For the last few years, Botkin has contributed to Sea Walls: Murals for Oceans, a nomadic public-art festival that aims to raise awareness about issues facing the world's waterways. That mural in New Zealand? It was created as part of Sea Walls, as was this homage to Jacques Cousteau, which Botkin painted in Cozumel Island, Mexico. This month, a sort of spin-off to the festival will hit Toronto, and Botkin is the artistic director. Called a Love Letter to the Great Lakes, 23 international artists will arrive in the city and collaborate on new works around the Lower Don River, Ossington and Queen West areas. Between June 20-25, they'll create 17 murals. Additional programming involves panel discussions and an exhibition that will take place at Ossington gallery Rally. Like Sea Walls, the event is overseen by PangeaSeed, a Hawaii-based art/activism foundation, and Botkin says "the primary goal is to generate awareness." "Nobody's making money off of it. The artists are not getting paid," Botkin says. "We feel very passionately for the issues and those lakes aren't waiting for sponsors." In terms of action, Botkin says local non-profit partners, which include Lake Ontario Waterkeeper, will "point towards solutions and ways that the community can get involved." "Every [artist] is charged with investigating some kind of issue or solution regarding the lakes," he says. "We're calling it a Love Letter to the Great Lakes — really underlying and emphasizing that positive idea of art being able to creatively challenge some pretty serious issues, but in a way that opens up a beautiful dialogue, one that invites the artist, but also the public — and the sponsors and corporations involved, too — to express some sentiment of love." As for why he's interested making art with an ecological cause, Botkin says it's as universal a subject — global, really — as they come. "Environmentalism is a topic that presents an interesting door to open up with people," he says. "It's easier to talk about the environment than it is to talk about politics," for example, "but the conversation may lead back towards politics or the financial structure." "I think art can touch people that statistics and facts and figures can't. It touches them on a more unconscious level, and it invites them to think about an issue in a much different way," he says. "The doors are of all different shapes and sizes, so as long as you open the door you're walking in the right direction." At the moment, the door happens to be shaped like a fish.